Christmas delivery | In the Crayon Patch.. I had a special request from a friend for a Christmasy table runner. Her house has a muted palette of off-whites with small touches of soft greens and reds. The perfect background for a bright red and green table runner, in my opinion. 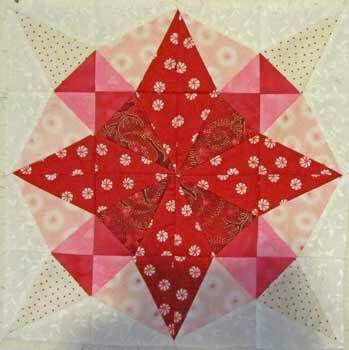 I decided to do a star pattern in reds and greens, and browsed through all my books for star patterns that I was drawn to.. I am a HUGE fan of Marti Michell and her templates, and own almost every template she sells. I ordered her A and B set (why didn’t I have these already? ), and they arrived yesterday. 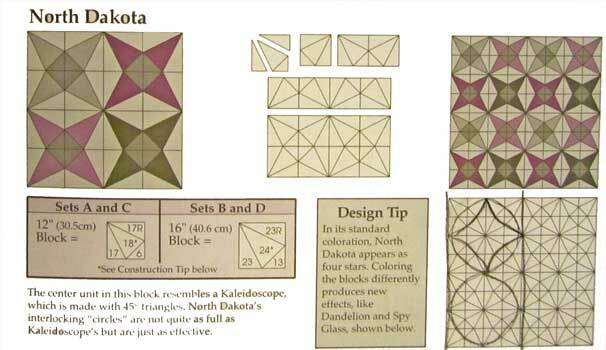 I decided to try the North Dakota block from Marti’s book. The circle outlines on the bottom right layout are mine, to remind myself what I want to emphasize. I should go to the gym today, buy groceries, weed the garden, etc. but I am WAY too eager to play with my fabric and make some test blocks to do those things right now. Here is the first block I have made. I love the illusion of circles, although I might have been able to emphasize this a bit more with a slightly different choice of fabrics. I love it, and am really impressed with how those templates make it easy to get points to line up so well. Good thing I tried this! I need to play with the blocks a bit to show the centre circles created where the blocks meet. OK, enough playing. I’ll make another test block later and post when it is done. Such fun!